Gol Gumbaz is the second largest Dome(Gumbaz) structure in the world and Largest Dome in India, which is Unsupporeted By any pillers, This one of Wonders of civil Engineering field so feel to be proud. It is located in Bijapur,Karnataka, India. If you want This places's Location on Google map Click Here. Here I am visited so many times, it has beautiful Garden's around the Dome and many trees. And the top view from the terrace of Gumbaz is Awesome the whole Bijapur city will be Seen wonderfully. 😀 so One must visit this Place in their Life. 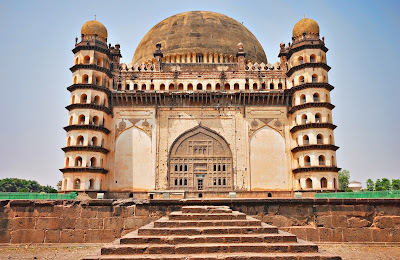 History:- Gol Gumbaz, the mausoleum of Muhammad Adil Shah (AD 1626 –56) located in Bijapur, District Bijapur, Karnataka State is an important monument of Indo-Islamic architecture aptly known for its amazing dimensions and unique acoustic features. The construction of this building was completed and the deceased king was interred in this building in 1034 AH (AD 1656) and contains the sepulcher containing the tombs of Muhammad Adil Shah (AD 1626-1656), the seventh Sultan of the Adil Shahi dynasty, his wives and daughters. Soon after his accession to the throne in AD 1626, the Sultan started constructing this edifice for burying his mortal remains. He was buried in the vast vault beneath the floor along with other family members. The exact position of the real tomb is indicated by the wooden canopy kept on the high platform at the middle of the floor of the hall. And this Gumbaz is a fine piece of Islamic architectural style. 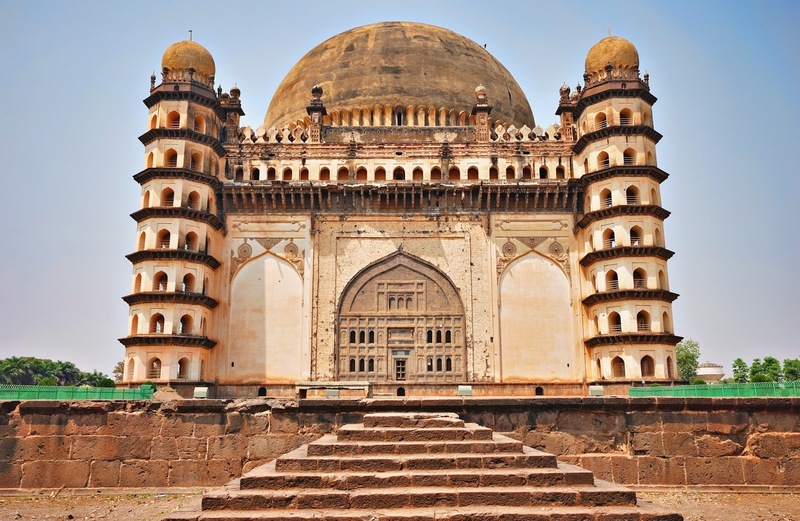 The Gol Gumbaz has a floor area of 1700 square meter, a height of 51 meter and diameter of 37 meters with 3 meter thick walls. The construction of this large tomb took around 20 years to complete. 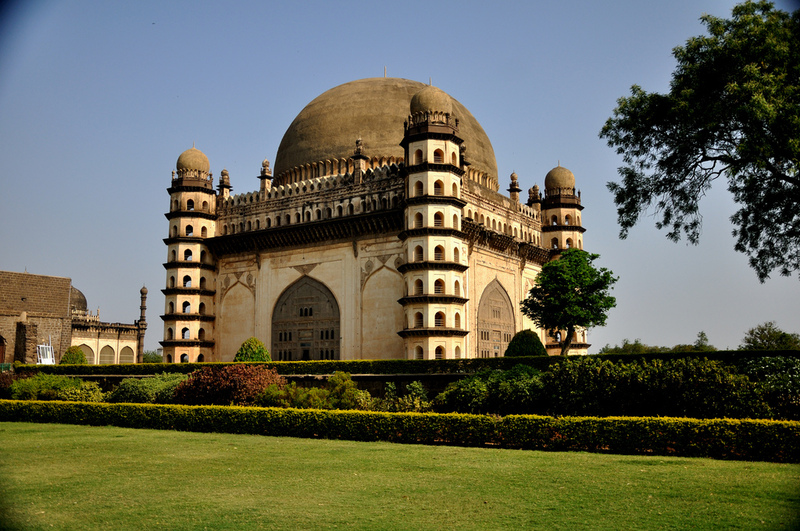 Another significant feature of the Gol Gumbaz is its central dome which stands without the support of pillars. Also the central dome of Gol Gumbaz is the second largest dome in the world after the dome of St. Peter's Basilica in Rome. And At the eighth storey is a broad gallery around the dome which hangs out at around 11 feet. It can be reached by means of a winding staircase in the four towers. It is known as the Whispering gallery(incredible acoustics) as a tenfold echo can be obtained from here. From the base of the dome there is a fine view across the city. Fact:-A `bijli pathar` is seen hanging over the main entrance which is the south door. It is actually a piece of meteorite which is believed to have fallen during the reign of the Emperor. It is believed that the stone protects the tomb from lightning. So we can Wonder that In the 17th Century also Without that much of knowledge of Building and construction How they Build this Gumbaz? A massive Hats off Goes to them who was build that Gumbaz.